North Tahoe junior Maddie Roberts skis to a first-place finish in slalom at the NIAA state championships on Monday at Sierra-at-Tahoe. The North Tahoe boys and girls’ 2018-19 state champion alpine team poses after taking first place in slalom, giant slalom, and combined at the NIAA state championships. North Tahoe junior Aliza Neu defends last year’s giant slalom state championship, claiming gold at Kirkwood Mountain Resort on Tuesday. 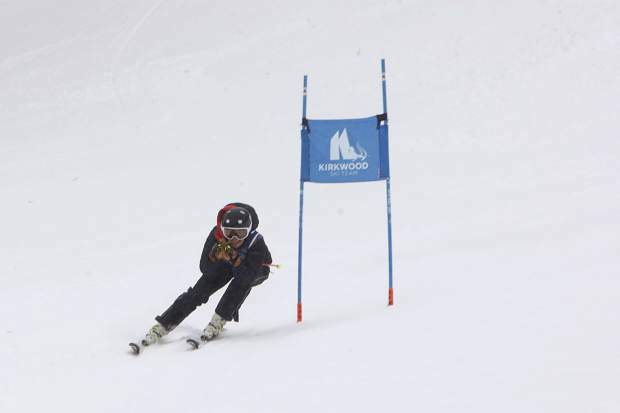 North Tahoe freshman Toby Gajar (pictured at Sierra-at-Tahoe) won his first high school alpine race Tuesday at Kirkwood Mountain Resort. The first-place finish netted Gajar a state championship in giant slalom. 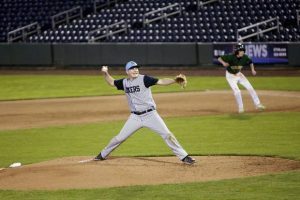 The North Tahoe alpine team was best in the Tahoe Basin League all season long. 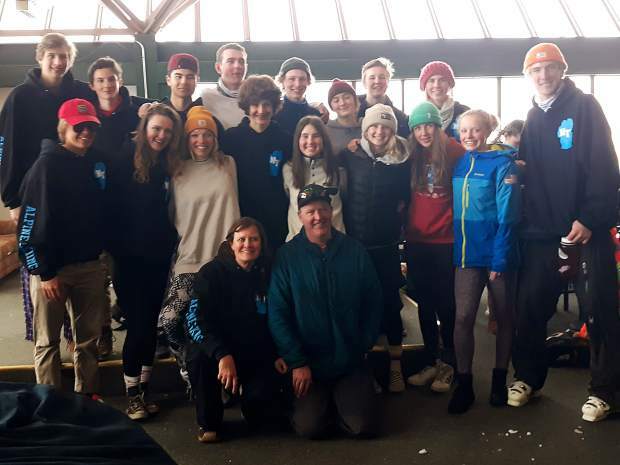 This week the Lakers boys and girls capped off the year by three-peating as the state’s top alpine teams at the Nevada Interscholastic Activities Association State Championships. 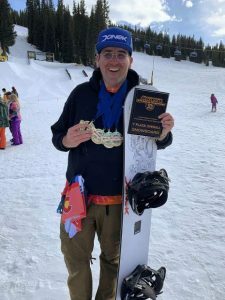 North Tahoe’s haul included a trio of individual state championships, as well as a sweep of the team state titles for the boys and girls in slalom, giant slalom and combined. “I’m so proud of the kids. 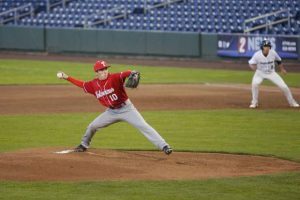 They really came together as a team and showed incredible depth,” said Assistant Coach Gretchen Sproehnle. The Lakers struck gold on the first of two days of competition, claiming team wins and an individual championship in slalom at Sierra-at-Tahoe. Conditions proved difficult on a pair of courses that soon became rutted, but North Tahoe junior Maddie Roberts managed to outduel a deep field of racers to claim first place by nearly three seconds. Roberts finished the morning with a combined time of 1 minute, 30.74 seconds. Teammate Aliza Neu was second with a combined time of 1:33.43. Truckee’s Emma Spillman was third with a combined time of 1:34.66, followed by North Tahoe’s Kacey Benjaminson with a combined time of 1:36.78, and Incline’s Brenna Ritchie in fifth place with a combined time of 1:39.39. 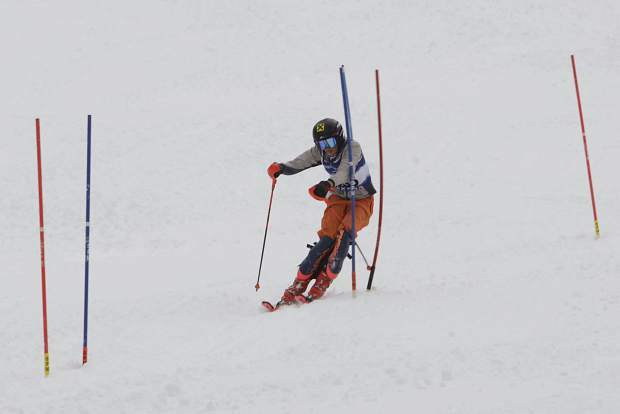 On the boys’ side, Whittell senior Gunnar Barnwell fought his way down the two courses to capture the individual slalom state championship with a combined time of 1:26.77. 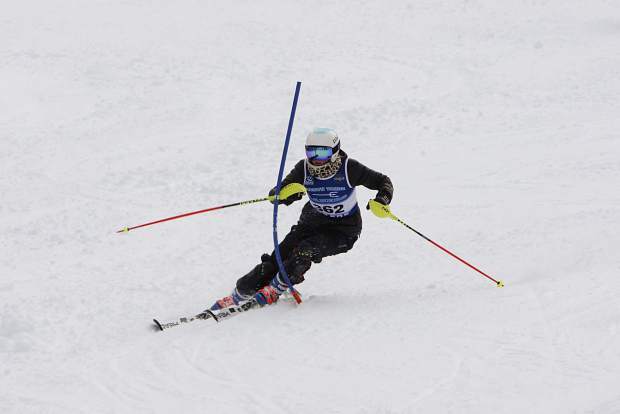 Norton swept the slalom and giant slalom events as a senior last year. The North Tahoe boys combined to win the school’s third straight slalom state championship as a team. Max Kelly led the way, finishing with a combined time of 1:27.12 for second place. Trent Carter was third with a combined time of 1:29.44. Toby Gajar was fourth with a combined time of 1:32.45, followed by Thomas Mercogliano with a combined time of 1:33.64, and Oliver Fralick with a combined time of 1:36.15. Conditions on the second day of racing were worse than Monday’s. Instead of the slalom courses that became rutted out by morning’s end at Sierra-at-Tahoe, skiers had to contend with snowfall, crosswinds, and soft snow on the giant slalom courses at Kirkwood Mountain Resort. Incline’s Ritchie navigated the conditions better than any skier to open the morning’s competition. Ritchie posted the fastest first run to begin the morning, crossing the finish line with a time of 37.47 seconds. 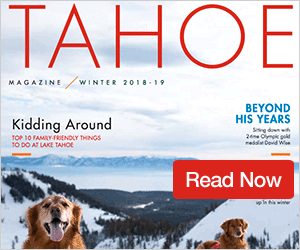 North Tahoe’s Neu, who finished with the second fastest first run at 37.82, obliterated the course in her second run, finishing more than a second faster than any other skier to defend last year’s giant slalom state championship. As a team, the North Tahoe girls won the giant slalom, and combined state championships this year. The Lady Lakers have now won the past three giant slalom and combined sate championships. The North Tahoe girls were also this year’s academic champions, finishing with a 3.82 GPA. In boys’ racing, a North Tahoe freshman picked a good day to notch his first high school alpine victory. The Lakers’ Gajar posted the second fastest time of the morning during the first runs, finishing just behind teammate Carter. A timing malfunction during Gajar’s second run nullified what would have been a solid result, and sent the freshman skier back to the top of the mountain in an attempt to knock off Carter, who sat in first place after finishing his second run. After several other skiers made their way down the course, Gajar again got his opportunity. “I was like, ‘Alright, let’s just do it again. Now I know the course, might as well just ski faster’” said Gajar, who went on to post the fastest second-run time of any skier to capture the giant slalom state title. Gajar finished 0.10 ahead of Carter to take the win. As a team, the North Tahoe boys captured first place, marking the fourth consecutive year the Lakers have won giant slalom. North Tahoe also won combined for the third consecutive year.